An air compressor is the powerhouse of any air system. However, this essential component would be useless without its piping. As such, you need to ensure that your piping is as efficient as possible. Optimal efficiency comes from leak-free piping and systems with minimal pressure drop. A properly designed compressed air system will have a pressure loss of less than 10% of the compressor's discharge pressure. Learn about these three factors that impact pressure drops in your compressed air piping and you will be one step closer to optimal efficiency. As water corrodes certain types of pipes, rust can flake off into the air stream. When combined with vapor, that rust can clog the nozzles of the end-use equipment. A rusted pipe will also have a corroded interior. This creates a rough surface and causes turbulence in the air flow, resulting in reduced air pressure. You can reduce moisture by changing the inlet source of air or adding an aftercooler filter. When there are sharp angles in the design of your compressed air piping system, you may see reduced pressure. This is because sharp angles cause the speed of airflow to slow down. When air goes around a sharp bend in a pipe, it ricochets off of the interior and develops an undirected course that wastes energy. The ricocheting effect also results in turbulence, which decreases pressure delivery. Ensure that your pipes are in straight lines for the best efficiency. Any corrosion in pipes can break off and form obstructions in the system. These obstructions typically occur where there are valves, connectors, or other devices. As a build-up of elements reduces the diameter of the pipe available for air flow, it results in pressure drops and backs up pressure in other sections of the piping. Using air filters and piping made of non-corrosive materials can reduce the risk of obstructions. 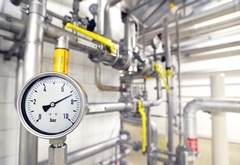 If you don't have efficient compressed air piping, you don't have an efficient system. Contact Rapid Air Products today to learn more about how you can improve your system.